Antalya, Turkey - May, 18, 2018. Point of view of the person who walks around the restaurant. 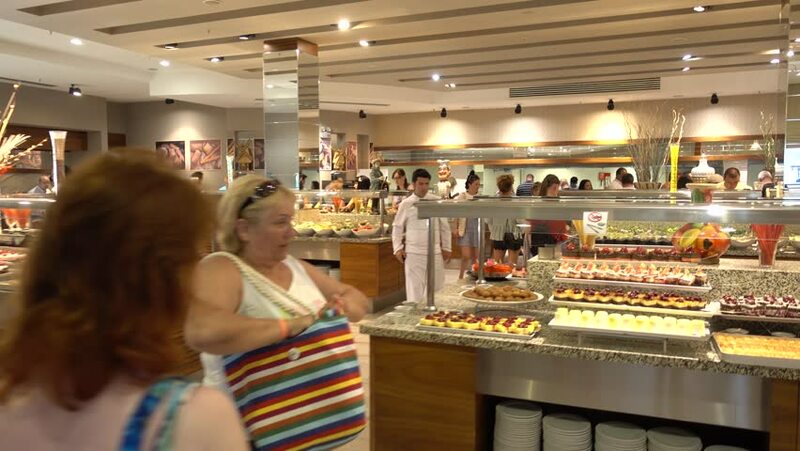 Buffet restaurant in a luxury resort. People walk around with their plates and choose food. hd00:10MOSCOW, RUSSIA - DEC 8, 2012: Bakers and buyers in supermarket of home food Bahetle. Bahetle company was founded in 1991.
hd00:16CHIANGMAI , THAILAND- JULY 26 2015: Inside of Central Festival Chiangmai. New Business Plaza of Chiangmai. About 3 Km. from Chiangmai City, Thailand. hd00:06MOSCOW, RUSSIA - DEC 8, 2012: Counter with salads in supermarket of home food Bahetle. Currently company Bahetle has 25 stores.